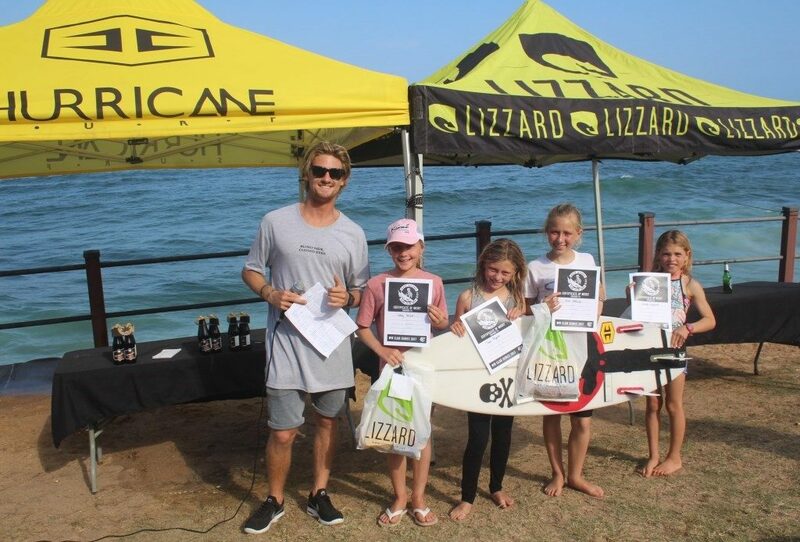 Last weekend, the close on 75 entrants in the uMhlanga Wave Wizards Club surf event were treated to perfect summer weather. with a light sea breeze. The spring tides at Bronze Beach created an Amphitheatre type effect allowing surfers to hear their live scores, and spectators up close and personal with the action. In the premier Open Men’s division Beyrick de Vries posted an excellent 8.67 for a single ride in the dying moments of the heat to steal the win from Matt Kruger, while Kat Steffen showed fine form in the Open Ladies taking the victory. Mike Frew was on form and took the win in the Masters Men division. In the highly contested U18 Boys division, positions changed throughout the heat, with Tide Lee Ireland finally bagging the win. In the U16 girls division, Gabi Lailvaux took the win, while Luke Thompson was the clear winner in the U14 boys division. Tricky ocean conditions during the U12 boys final challenged the surfers, seeing Julian Carbonal coming out tops. The u12 girls showed no fear all paddling out without help, with Gaby Herbst the outright winner. Many brave young novice boys showed up to compete with their Dads paddle assist, with the Frew family and their son Damien taking the victory.